A horse harness is a horse tack. 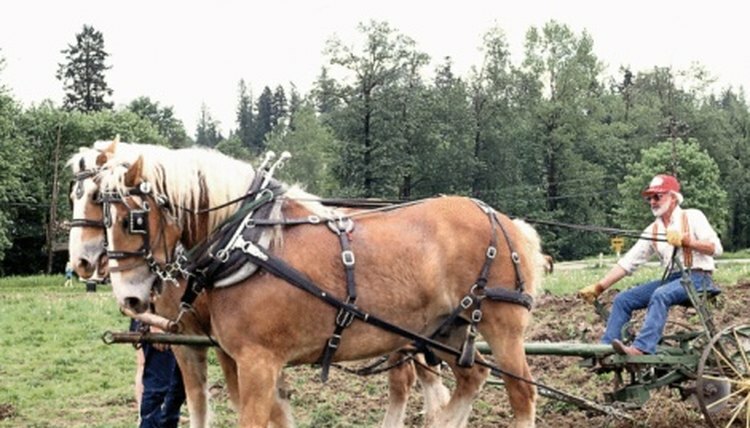 The harness allows the horse to pull wagons and other horse-drawn vehicles behind it. There are two kinds of horse harnesses: breast strap and breast collar. Show horses pulling light carts wear the breast strap. This harness places the weight of the cart on the horse’s sternum up near the windpipe. The breast collar puts the weight of the cart and load on the horse’s shoulders. The horse can use all its body muscle to pull the load. The phrase for hooking up a team of horses is harnessing up. Put the breast collar over the horse’s head. The horse will stand still untied waiting for the harness. Hook the back straps into the britchens on the cart. The britchen attaches to the pole straps and neck yoke straps on the cart. If you are harnessing up the lead team of horses there is no britchens. Lead team horses use croupers not britchens. Lift the bridal up to the face of the other horses on the team. The horses are standing still, untied waiting for harnessing. Insert the bridle bit into the horse’s mouth gently. One type of bit popular for pulling large carts is the Liverpool straight-shank bit with side check straps. Place the bridle and check straps over the horse’s ears and let them rest on the back of the head. Straighten out the heart rings on the bridle. The heart rings keep the driving reins straight. Run the driving reins back to the cart and let the ends rest on the cart. Step up into the cart and grab the driving reins. Do a visual check of the harness to see if all buckles and straps are secure. Look to see if the driving reins are untangled. If all is good, enjoy your ride. Buckle the bridle on the head of each horse. Stick your fingers underneath the bridle before buckling. If your fingers fit comfortably between the horse’s face and the bridle, then the tightness is good. Always let the horse see the bridle and harness instead of surprising them. The horse does startle in spite of training. The horse will act out if the bridle and bit is too tight, and will not obey if it is too loose.